Now that Holden and I are finally settled back into our house after The Great Asbestos Crisis of ’16, we’ve been enjoying our new floors and wall color. Our house used to have dark laminate flooring, which we replaced with light, natural-colored, wood-looking tile. The walls were a plethora of hues– a mint green living room, beige hallways, and then the grayish white in our dining room which we ended up painting all the walls this time around. I can’t wait to incorporate more home/lifestyle content on the blog next year, as we add more finishing touches throughout the house. In the meantime, here’s a little sneak peek of how we’ve been mixing things up in our living room! I absolutely love how fresh and bright everything looks after the renovations (perfect for indoor photography), but we wanted to incorporate some accents in our decor to keep it from appearing too flat. 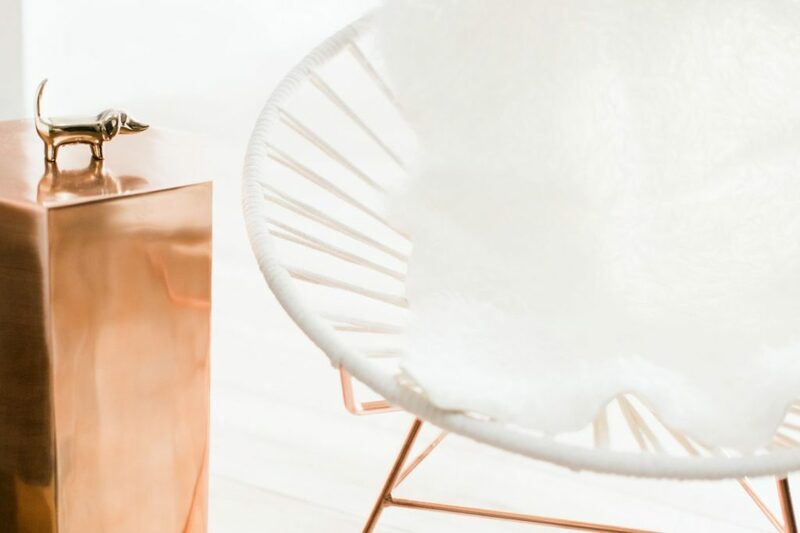 Our solution has been to contrast our minimalist mid-century furniture with rose gold (copper) and gold (brass) items. Holden has been insisting for months that mixing metals is in, and I’m so glad I took his advice.